Grey Nun Academy hosted a 55th anniversary liturgy and celebration on Tuesday, November 20th. The Grey Nuns of the Sacred Heart were invited to participate. The school opened in 1963 and has graduated thousands of students educated in the tradition of St. Marguerite d’Youville and the Grey Nuns of the Sacred Heart. 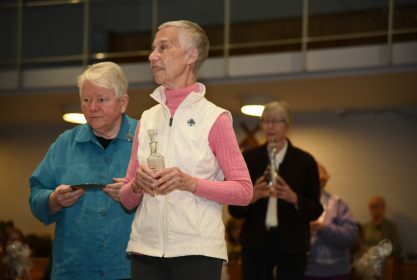 Students, faculty, parents, and Sisters of the Grey Nuns of the Sacred Heart gathered together in the chapel to honor the school’s 55 years and express thanks to the Sisters for their loving and unending support. Following the liturgy, they congregated in the McKenna Center and launched into dancing, games, cheers, and happy smiles. Sisters participating in the anniversary liturgy and pictured here are Sr. Bridget Connor, Sr. Diane Bardol and Sr. Barbara Schiavoni. Sisters Anne Marie Beirne, Dolores Beatty and Maria Christi Drysdale and Eileen White were also in attendance. Congratulations Sr. Diane! Thank you for your fiat to serving our Lord and us, His children.